In 1974 Terry took over part of an old family business on its dissolution, which had been in business for 50 years. 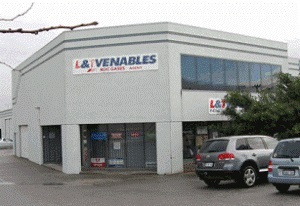 This business was called Venables Service, and became L & T Venables relocating to Wembley Perth, W.A. L & T Venables moved to various locations before settling in Wangara Perth in 1986, and then opening a second store in Malaga, around 1997. Both stores have a fabulous showroom, Wangara 450sqm, Malaga 320sqm with a combined staff number of 14. L & T Venables sell into the Industrial and Engineering market, stocking a range of welding products, hand tools, power tools and fasteners, just to name a few. Having a vision of extending the fastener range, L & T Venables felt that joining CSS would significantly help in this area, not to mention strengthening their trading arrangements with our supplier partners.